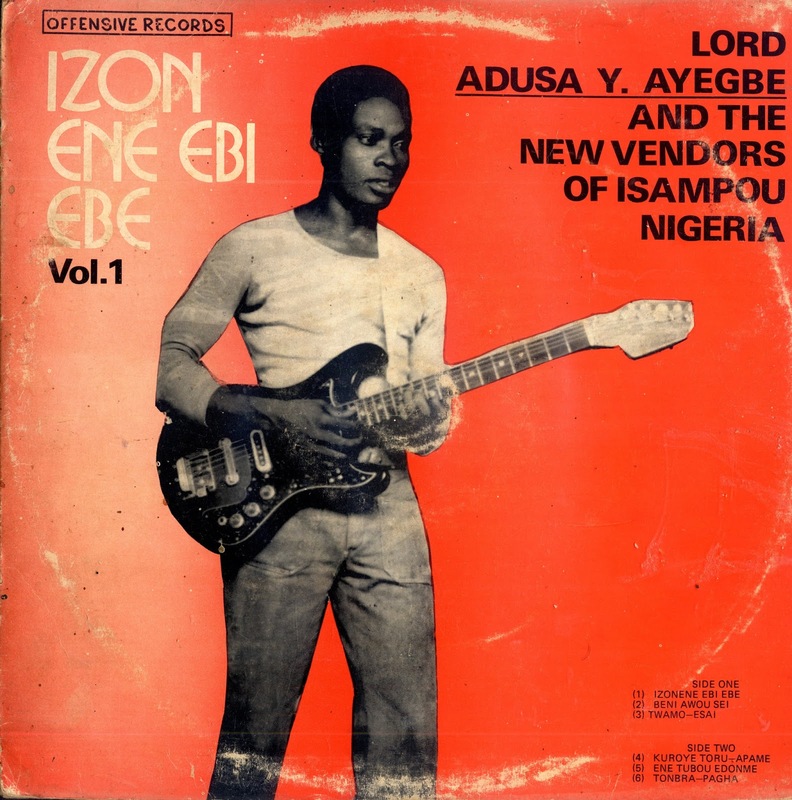 For the next selection on the highlife turntable I have selected the track Twamo-Esai by Lord Adusa Y Ayegbe off a 1977 release Izon Ene Ebi Ede. "The well known Ijaw philosopher, Lord Adusa started playing music at the age of 14, when the so called Asiko was existing far back in 1958. During that period he was to appear in public shows, leading a band called the Young Stars Dance Band "isampuo" After a long struggle he decided to change to another business for lack of instruments to perform on stage in a high temple." Fast forward to 1977 and Lord Adusa releases this LP. He would have been 33 at the time of this release and his music is considered Ijaw highlife, which would have made him a contemporary of such first generation Izon perfomers like King Ebizimor and I.K. Belemu. The song is basically an interplay between the spacey guitar lines and the plaintiveness of the vocals, which includes a flawless call and response between Lord Adusa and his chorus. It is a short song, but a good early example of the philosophical power of Izon vocals. This power would be the foundation on to which the Izon Highlife movements would be built in the 80's and 90's. I found the lyrical quality of the song haunting. I hope you like it.